Blizzard has released a new Heroes of the Storm trailer to mark the game's long-awaited entry into open beta. 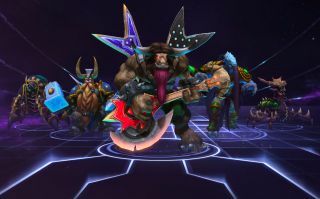 Heroes of the Storm has been in closed beta since January, and in early June it will fling its doors open to the world, but in the meantime we'll have a couple of weeks to enjoy that hazy space in-between we call "open beta." What that means is that you may now pop over to Heroesofthestorm.com, grab the client, and play to your heart's content, without needing anyone's special say-so. But there are one or two caveats. "Kindly keep in mind that Open Beta is still not final release, and we will be closely monitoring the game to ensure a positive play experience for everyone," Blizzard wrote. "Should one-too-many brawlers try to cram through the Nexus Portal at once, you may encounter a queue when attempting to log in to the client. Not to worry, however, as the wait should be brief, and you’ll be back to crushing opponents in no time." Blizzard also announced that the launch of the game will be preceded by a live event held in London, UK, on June 1. The show will feature interviews with developers, appearances by "guests from the world of gaming," and live music, and will of course be livestreamed as well. Find out more about what's going on, and how you might be a part of it, at NexusCalling.com.